Trucks, buses, coaches, tractors, agricultural vehicles, fire engines… vehicles that are all completely different from one another, with a single common denominator: power. 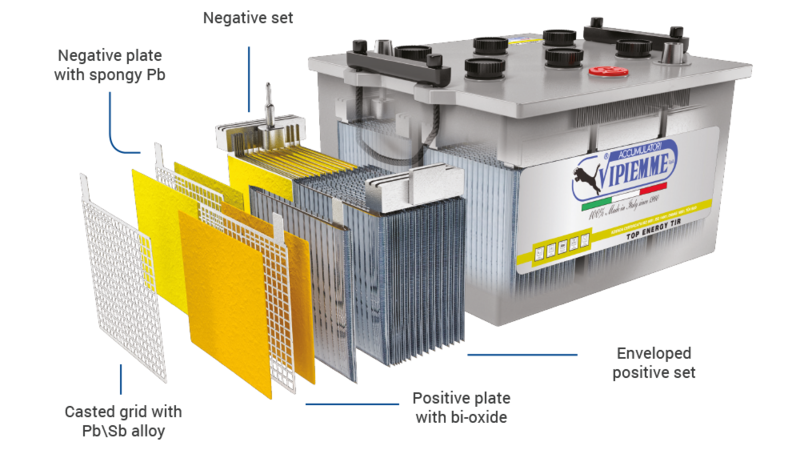 The Vipiemme batteries are designed to meet the needs of each type of heavy vehicle and offer unrivalled power. High energy demand, resistance to vibrations, leaks and the most intense weather conditions, along with resistance to cyclic stress from frequent re-starts are some of the most complex requirements for the sector, in terms of variety and competitiveness. The SAFE POWER TRUCK SHD range is specifically designed for heavy transport and guarantees high reliability, combined with all the necessary power. Fused grid technology is used, with positive grids consisting of classic antimonial lead and the negatives in Pb/Ca alloy. The grids have a high mechanical resistance to vibrations, so much that laboratory tests indicate that the batteries, with the help of anti-vibration inserts, exceed the V3 test more than five times, in accordance with EN50342-1. The new lid with labyrinth and central degassing permits the recombination of gases formed inside the cells, thus lowering water consumption. 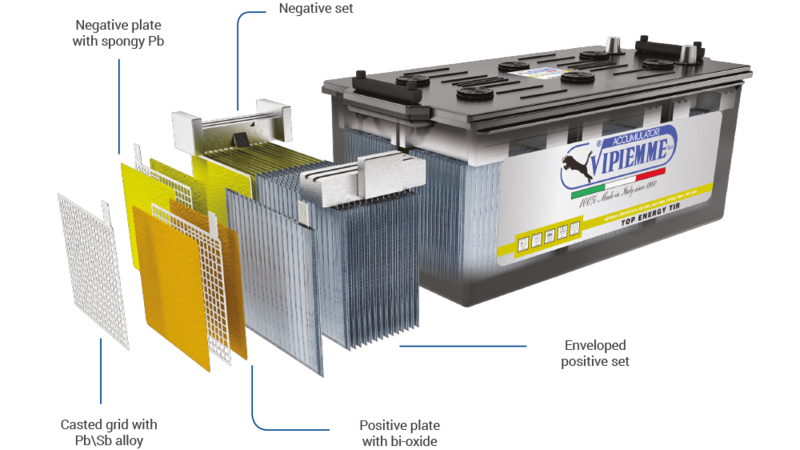 Thanks to all these technological elements, the battery has the capacity to manage all the range of electrical absorption situations required with the engine off, whilst maintaining the characteristics of a starter battery. The TOP ENERGY TIR range, in the “charged” version, is made specifically for heavy-duty transport, and has an excellent quality/price ratio. The technology used is that of grids cast in Pb/Sb alloy, with its plates being thicker than the standard technology. Thanks to the use of primary lead, the range has characteristics of high-resistance to corrosion and vibration. It also has a very low water consumption due to the reduced percentage of antimony present in the alloy. The HI-PERFORMANCE polyethylene envelope separator has a remarkable mechanical resistance, providing a guarantee against internal short-circuiting. Thanks to the new and unique grid design and the excellent charge acceptance, the battery guarantees prolonged life cycle and meets the increasingly-stringent demands of on-board electronics. In order to further reduce water consumption within the range, there are with sealed lid with central degassing and labyrinth. The DRY-CHARGED TOP ENERGY range is specifically designed for heavy-duty transport, with an optimal quality/price ratio. The technology used is that of grids cast in Pb/Sb alloy, with its plates being thicker than the standard technology. Thanks to the use of primary lead, the range has characteristics of high-resistance to corrosion and vibration. It also has a very low water consumption due to the reduced percentage of antimony present in the alloy. The HI-PERFORMANCE polyethylene envelope separator has a remarkable mechanical resistance, providing a guarantee against internal shirt circuits. Thanks to the new and unique grid design and the excellent charge acceptance, the battery guarantees extended life cycles and meets the increasingly strict requirements of on-board electronics. 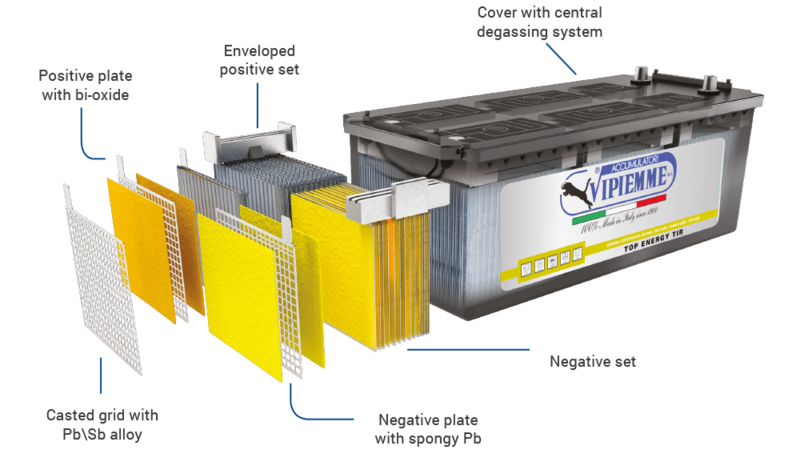 The batteries in theTOP ENERGY TIR HD range are built according to the same criteria as the TOP ENERGY TIR, with the addition of a lid with centralised degassing. Within this, the gases produced during the recharging phase are recondensed, creating water that ends up in the cells once more, thus decreasing water consumption. 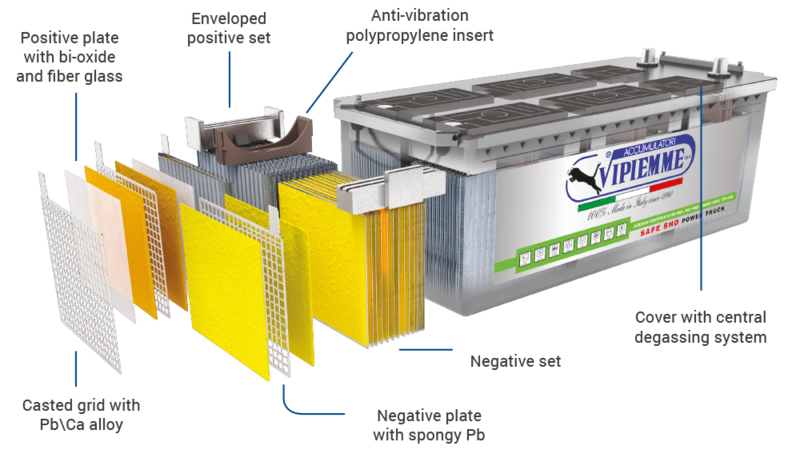 The SPIRIT range, which is also made with the same quality criteria as the TOP range, is a very versatile type of battery that is particularly suited to cyclical requirements. The SPIRIT range is in fact made with the technology of grids cast in Pb/Sb alloy, and the relative plates have increased thickness compared to standard technology. 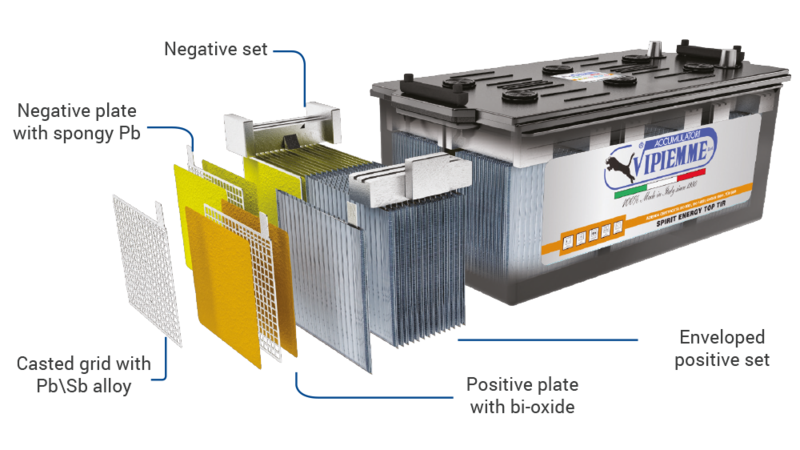 The lead used in the construction of the grids has a 99.99% degree of purity, and comes directly from the mines, which ensures a very high resistance of the battery to corrosion. The HI-PERFORMANCE polyethylene envelope separator has a remarkable mechanical resistance, which guarantee against internal short-circuits. Due to the new and unique grid design and the excellent charge acceptance, the battery guarantees extended life cycles and meets the increasingly stringent requirements of on-board electronics. In order to further reduce water consumption, the range includes three batteries with sealed lid, with central degassing and labyrinth.